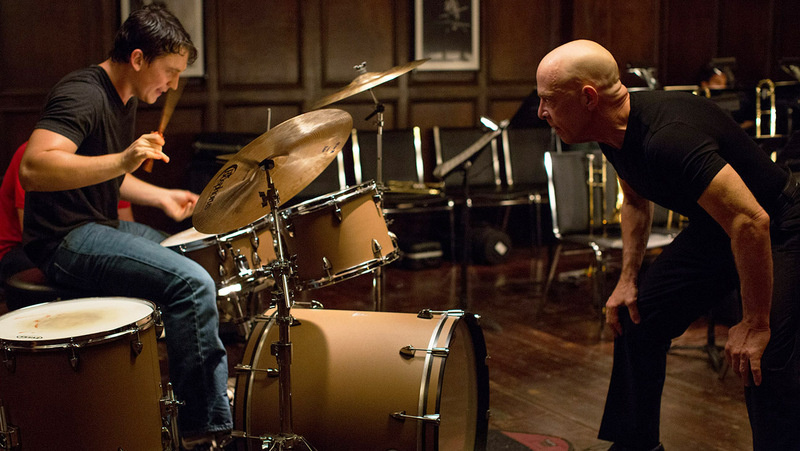 I finally got a chance to see Whiplash, starring Miles Teller and J.K. Simmons and directed by Damien Chazelle. I wanted to see this movie from the first time I saw the trailer months ago, but never got around to it. J.K. Simmons won the Oscar for Best Supporting Actor for his role in this film as musical instructor Terence Fletcher, which made me decide that I needed to see the film sooner rather than later. In short, this is a terrific film that I plan to watch again in the near future. Simmons’ performance as the ridiculous, borderline maniacal Fletcher is a joy to watch. He is one of the best villains I’ve seen in a supporting role since Heath Ledger’s Joker in The Dark Knight. And make no mistake about it, he is a villain in this movie. But unlike the Joker, Fletcher has layers of humanity that shine through the nuances of Simmons’ performance (which is why he definitely deserved that Oscar). Fletcher pushes his students because he wants them to be great – yet at the same time, does he want them to be great for their sake or for his own ego? The argument can go back and forth on this one. Teller’s performance as Andrew Neiman, an outsider type who finds his muse through playing the drums, is a well-crafted, grounded turn. Neiman awkwardly walks through life, only finding solace when he’s banging on the drums. But worse, he finds the most solace when he’s banging the drums within Fletcher’s band, despite verbal, physical, and psychological abuse from the instructor. A budding romance with lady friend Nicole (Melissa Benoist) stands little chance against Neiman’s pursuit to be one of the greatest drummers ever. The only person who seems to show compassion for Neiman throughout the film (or that Neiman allows to show him compassion throughout) is his dad Jim (Paul Reiser). Even that relationship, however, can’t hold a candle to the greatness Neiman feels he can reach with Fletcher. So it’s no surprise that the foundation of this film is the ultra-tense relationship—or more appropriately, the escalating rivalry— between Fletcher and Neiman. Fletcher uses tactics to push Neiman that should get him fired, but Neiman just comes back for more. Nothing can stop Neiman’s pursuit for musical greatness, not even unexpected twists of fate (you’ll have to see the movie to know what I’m talking about). Neiman’s determination is fascinating to watch, because you just know that Fletcher will never let up. Fletcher won’t go soft, and he won’t take it easy on Neiman. That’s not the character that Simmons portrays. He portrays a rather vile person who lives in a world where the greatest of men must get that way through any means necessary. Yet the story is crafted in a way that helps you understand why Fletcher thinks this way, even if you don’t agree with the means he uses to try to make his vision of the world happen (and in cinema, these are usually the best villains). All in all, Whiplash is like watching one long continuous mind game, and the main actors (along with the supporting cast) certainly stepped up to the challenge and made it work. This is a timeless film from Damien Chazelle, and a definite recommendation for all fans of cinema.